a purer way to get laundry that smells clean and fresh for weeks. 92% natural, this product’s unique crystal form works differently than traditional oil-based softeners that coat fabrics with oily residue, because it infuses fibers with long-lasting fragrance. In addition, since you add it directly with your laundry, this means no more waiting for the rinse cycle, no messy residual gunk in your washing machine, and no more stains from spilling liquid fabric softener. all laundry and will not harm, wear down or discolor your fabrics like oil-based softeners. Safe for all fabrics, including baby clothes, athletic wear, towels, and whites. The product won’t harm your clothes and is safe and convenient for the entire family! and will be available in food, drug and mass retailers nationwide. 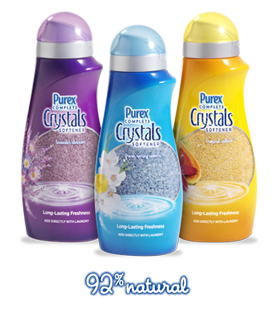 I have a coupon for one of my readers to try the New Purex Complete Crystals for themselves! The coupon is valid for one 28 oz bottle and expires 12/11. To Enter~This must be done before extra entries will count! Post a comment telling me one thing you learned about Purex Complete Crystals. please leave a method of contact so when you win I can email ya! 5. sign up for beezag.com and watch at least 2 videos useing the button on the left for 5 extra entries ~ please leave your first name and first letter of last name for verification. This giveaway will end on March 20th @11:59CST. I will choose a winner via random.org and publish winner on March 21st. Winner has 48 hours to return my email or another winner will be choosen. disclosure: I received a 4 load sample and a coupon for a full size bottle from Purex to try and review Purex Complete Crystals Softener. Coupon for free product will be mailed by me. I learned that Purex crystals are 92% natural and you add them at the start of your wash cycle. I learned that using other FS can make PJ more flamable =o YIKES!!! I learned that other fabric softeners has as much as 20% oil in em! That's something I never knew lol. All their videos teach something new though. The towel absorbency video really makes me want to try this product out, seeing the difference and how much whiter and new looking the purex crystals keep it. Hi, this is the other penny dreadful here! Great contest! I would love to try this..haven't yet! I learned that most fabric softeners are oil based (flammable even), and may even be causing our towels from allowing us to get dryer faster! This new fabric softener is infused and lasts longer. I follow you on Facebook, Gather and Twitter! I learned that you put it in the washer so that it is in with your clothes longer. I had no idea what the product was for before reading your blog, so I learned a lot, including that you use it in with your load. It protects your fitness clothing! It's "free of oil-based softening ingredients found in liquid softeners" and the "scent lasts for weeks, not days" :) *Thanks* for the giveaway! It's a pure way to keep laundry smelling clean and fresh for weeks and it's 92% natural. I learned it can be used in HE machines! That info is very nice to have! I learned that you can put them in at the beginning of the load! i just learned that you add the Purex Complete Crystals Softener at the beginning of the wash cycle. how convenient!